Celtic cross is a symbol of the centuries-long wisdom and a projection of the human desire for epiphany. Everyone has undoubtfully once seen a traditional Celtic cross, at least once even if he was unaware of its purport. This symbol is a traditional representation of the Christian religious movement for ancient Celts. There is a belief that this cross was introduced to this world by the missionary Saint Patrick, but there is no reliable data regarding the occurrence of this symbol. In our store, you can order Celtic Cross Sterling Silver Pendant Stylization – a stylish pendant made of sterling silver. However, like all our other products (for example, a stylish ring Draupnir Sterling Silver Viking Ring), you can choose it in 9, 14 or 18 K white or yellow gold. All the above options of the Celtic Cross Sterling Silver Pendant Stylization for sale include a strong cord that you can replace with one of the chains available in our catalogues. 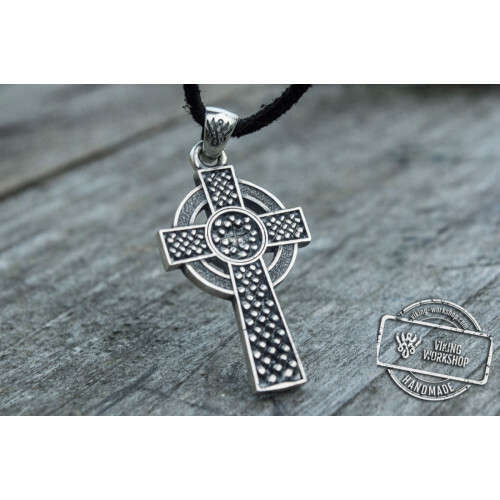 First and foremost you should buy the Celtic Cross Sterling Silver Pendant Stylization because of uniqueness of this pendant. Unlike traditional factory-supplied products being practically indistinguishable from each other, our handiwork is always unique because the entire manufacture process is made by the hands of the experts. Upon receipt of two different accessories, you may notice the individual features of a particular expert, as well as the particular differences that make the Celtic cross pendant, Custom Made 65G Steel Friction Folding Handmade Pocket Knife with Mikarty Handle FF and other jewelry in our shop absolutely one-of-a-kind.